Premium Car, Chocolate and Cocktails. The first night we hosted some 30 social bloggers, personalities and influencers. 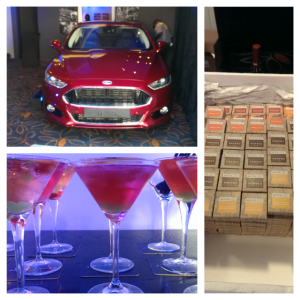 Things kicked off with a few brandy cocktails to carry on the Fusion theme. The Oude Meester Franklin and Collison’s Cosmos went down a treat as a welcome drink, especially as they were twisted a little to have litchi, apple and raspberry capsules at the bottom. A real burst of flavour at the end of the drink! All the brandies performed remarkably well, especially considering that many tasters were not used to drinking neat spirit at all. Once palates got acclimatised the conversation got rolling, and the tasting yet again proved how different individual taste buds really are. There’s no right or wrong in this tasting game, it really comes down to what you like or don’t like. Overall, KWV10 year old narrowly beat out Van Ryns 10 year old to first place, but only by a fraction of a point based on those tasters who filled in a survey card. Oude Molen Solera and Oude Meester Demant had very little separating them and both finished highly respectably with 3.5 / 5. All the pairings performed very well, but it was Oude Molen Solera and DV Origin Venezuela, Rio Caribe which ended up winning with overwhelming yes’s from the participants. The second nights tasting really got down to business, as we set up for 60 seasoned motoring journalists, many who had been involved in Whisky and Wine tastings numerous times before. Conversation really got going on these brandies with a lot of people asking questions about how production differed from Cognac, and numerous other production related questions. It seemed that curiosity was peaked by our humble and under-rated amber liquid, and a number of opinions may well have been changed! Unfortunately with such a big group, it was difficult to get many survey forms filled in, but from the few that did, top honours were shared between Oude Meester Souverein (18yo) and KWV 15 year old, followed by Oude Molen VOV and then Van Ryn’s 12 year old. It seems Oude Molen yet again came out tops with the pairing, something in their brandy seems to work well with these lovely dark chocolates! 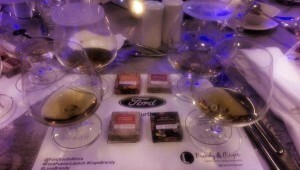 All in all it was a fabulous 2 nights, and Cape Brandy really shone in the limelight of some pretty intense scrutiny. 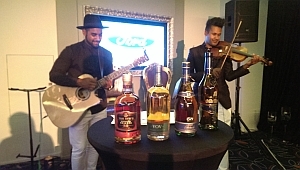 Thanks to Ford South Africa, 15 on Orange and Red Moon events for making this happen, a super pairing and certainly one worthy of sharing the stage with such a unique and premium car as the new Ford Fusion. « Fancy some French for Christmas? Try Bisquit.